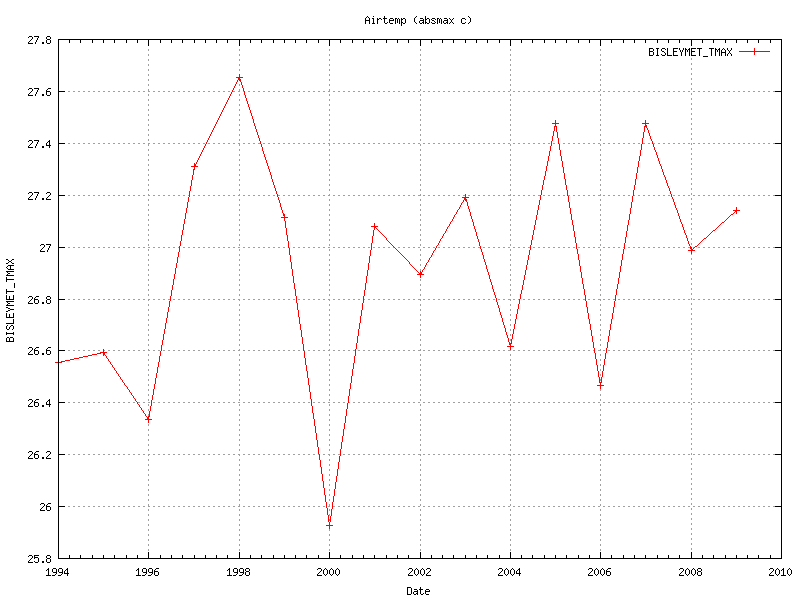 If we begin the chart in 1997, we find that temperatures have actually been dropping, and not increasing (see below). 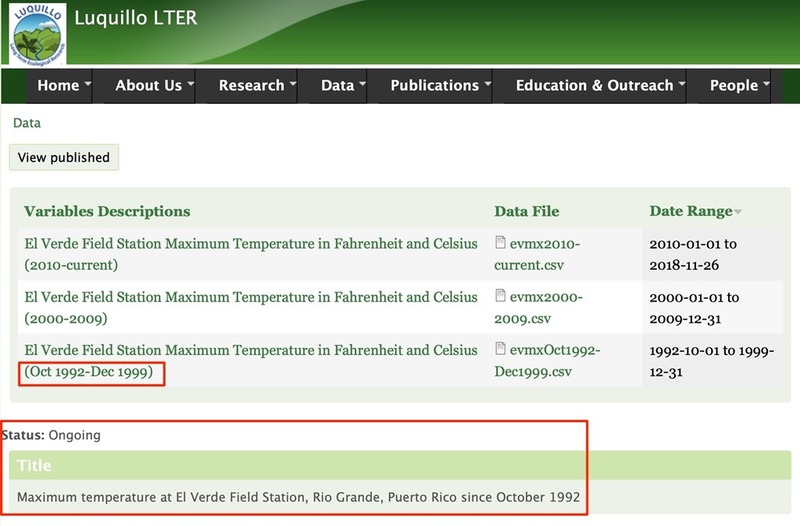 The metadata states that temperatures showed an abrupt increase in 1997, as the adjustments were ended. 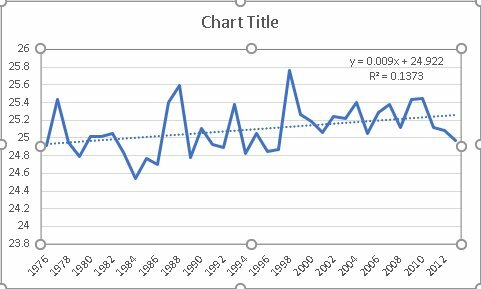 And this increase is clear on Lister’s chart (the above chart starts in 1997). ← Climate Wally of the Year Award Goes to Mail’s Mark Prigg! Science at it’s poorest, Bias Confirmation if ever we saw it. Great Analysis by you guys. Sadly it is science as it is now. Funding drives science. It is only been possible to get money from the likes of NERC if the ‘research’ is predicated on examining ‘impacts of climate change on……’ since the early 90’s. I expect US funding bodies have been similar over the past few years. Universities only employ those who get funding. ‘Science’ has nothing to do with it. It is about careers, salaries, security, all with a generous sauce of ego and arrogance poured over the top. The Western world is that elderly relative in cognitive decline. Why is ‘Modern Science’ so determined to help gull her? How did it come to this? Truly, I do not know. It’s crazy to believe that such dramatic declines could be correct, short of an insecticide bombing campaign. 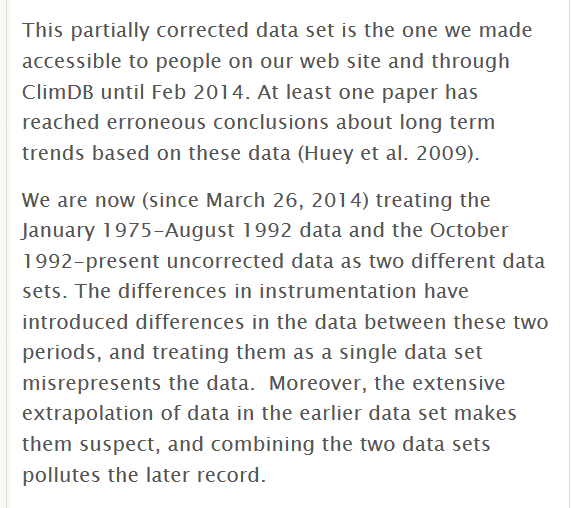 There must be some obvious reason – methodology, seasonality, etc. Do they have those rampaging ants there that march and kill everything in sight in an area – it could just be unfortunate timing? 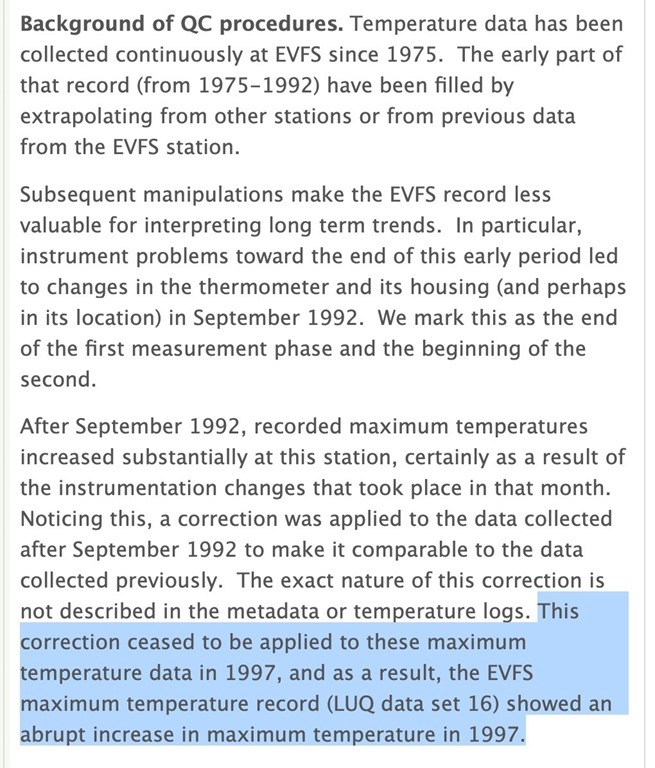 A really sad aspect of this outcome is that it diverts attention away from a very real problem in many parts of the world – including much of the UK – that hasn’t been studied correctly and the wrong, AGW-related conclusions drawn. I refer to depleted insect biomass, which has a profound impact on the overall natural food chain to the detriment of birdlife in particular. In Britain and much of Europe, the finger points strongly at the volumes of herbicide and pesticide used in many areas of farming – leaving countless acreage of fields ecologically dead for many months each year. Much more research, however, needs to be carried out to draw rational conclusions and come up with workable solutions. 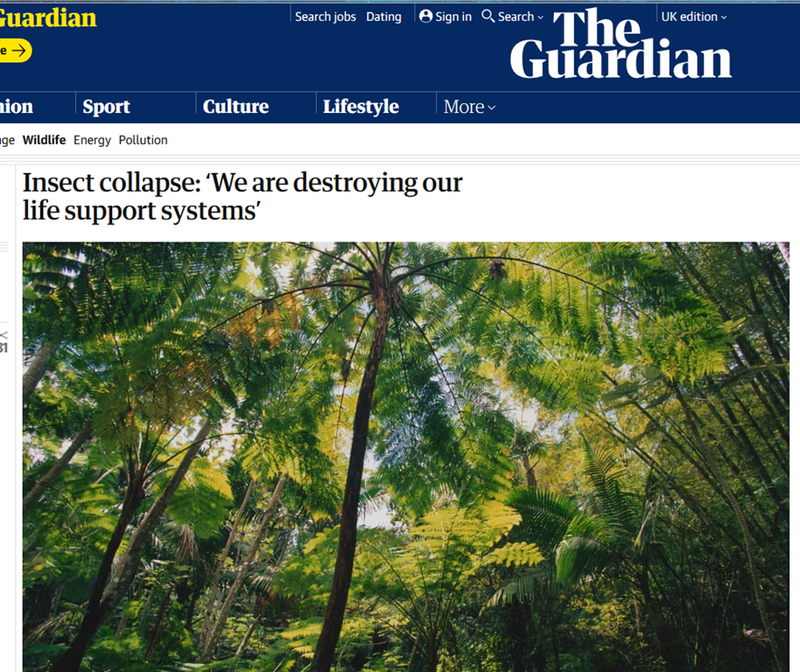 I have no idea whether these types of poison are affecting the tropics but one thing is for sure – manmade non-CO2 causes like deforestation are far more likely than CO2 rises which tend to enhance vegetation growth to the benefit of all. Absolutely spot-on, Ian! In UK it’s abstraction, industrial agriculture and habitat destruction. I would guess that there are similar, sound explanations for the PR problem – and that it has nowt to do with ‘Climate Change®’ at all. These issues are actually far more damaging than a few thousandths of a degree change in the weather too. Peer review has never been about detailed checking, given that it is unpaid, usually anonymous, and the day job still has to be done. The real weapon for improving quality is reproducibility, all data and methods should be archived (routine in the real world of engineering) and made available to the public. The simple fact that someone (probably not a peer reviewer) might check what you have done should create what now appears to be out of fashion … the fear of making a mistake. The Pleistocene glaciation which began some 2.58 million years ago is still ongoing with the ice advancing and retreating in approximately 100,000 year cycles. During that time there have been between 5-7 glacial episodes, depending upon which timeline you look at. The most recent Wisconsin Glacial Episode lasted from ca. 75,000-11,000 years ago. Currently, we are in an interglacial period with warming, melt and isostatic rebound of the crust. Our 2 major plant groups are the seed plants, Gymnosperms (pine, spruce, fir, etc.) arose during the Triassic Period between 245 and 202 mya. Then came the flowering plants or angiosperms in the Cretaceous 160 mya and became dominant by 120 mya. Insects evolved along with the flowering plants. So let’s just say, they have all be around for quite some time. Polar bears separated from the brown bear some 600,000 ya as a distinct species. Penguin fossils in New Zealand have now been found dating back to 61 mya. And I DO have a point with all of this. The plants, animals and insects have been around during all or most of this. Mass extinctions occurred prior to this period (Tertiary-Cretaceous Boundary, etc.). In botany, we said that the plants were “pre-disposed” meaning that if they survived one such episode, they had the genetic material to survive it again. This applies not only to plants, but to animals (even the cuddly polar bears and cute penguins) and the insects which depend upon the plants. They have made it when it was much cooler than today and they have made it when it was much warmer than today. They made it. They will make it. In cold weather, insects slow down, and in hot weather, they become more active. During a warmer-than-normal winter, fewer insects die as a result of extreme cold. That means more insects are available come spring. In hot weather, insects’ reproduction rates increase and they grow faster. 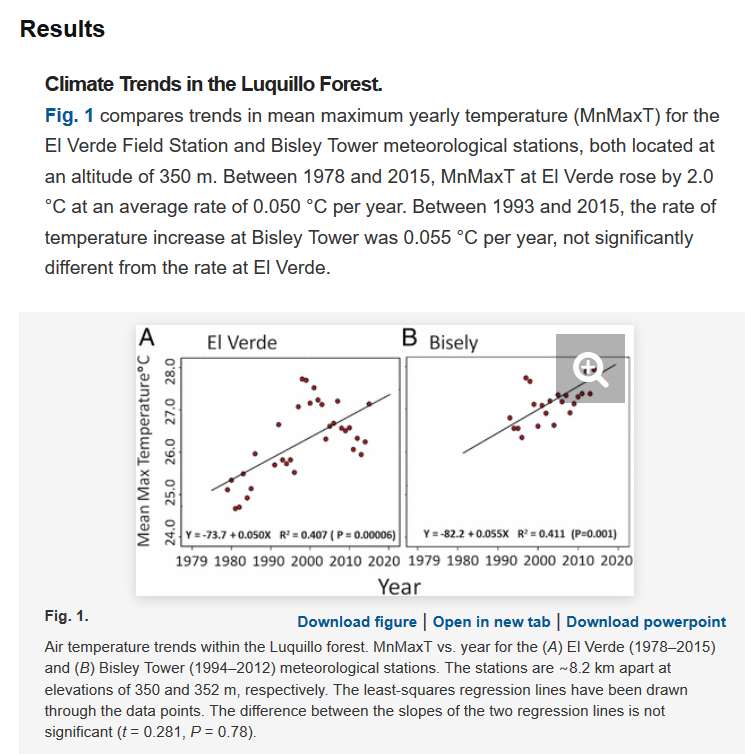 It is also suggested that the weather data at El Verde is obtained from ‘a tower above the forest canopy…’ http://evfs.ites.upr.edu/research/meteorological-data – I’m not sure how the authors reconciled ‘above canopy’ temperatures from said mast with forest floor temperatures. After all the study was related to the ground fauna (albeit some of these may fly). I previously posted on why rising temperatures (even if they occur) are not the threat they claim, according to what is known about insects and heat stress. These scares always sound plausible, but on closer inspection are simplistic and unrealistic. The details show that each type of insect has a range of temperatures they can tolerate and allow them to develop. They are stressed and populations decrease when colder than the lower limit and also when hotter than the upper limit. Every species will adapt to changing conditions as they always have. Those at their upper limit will decline, not increase, and their place will be taken by others. Of course, if it gets colder, the opposite occurs. Don’t let them scare you that insects are taking over. Yes – the likes of mosquitoes must be super intelligent & adaptable, whilst cuddly things like polar bears are supposed to simply stay put & perish. “Climate change promotes the spread of mosquito and tick-borne viruses. Please let everyone know what their response is to this absurd peer-reviewed? paper trying to put the blame on “global warming”… another “me-too” publication. Arthropods include many species such as ants and cockroaches, whose survivability has been predicted to outlast Man’s, even in the event of nuclear devastation. One wonders why that didn’t occur to Messrs. Lister and Garcia. 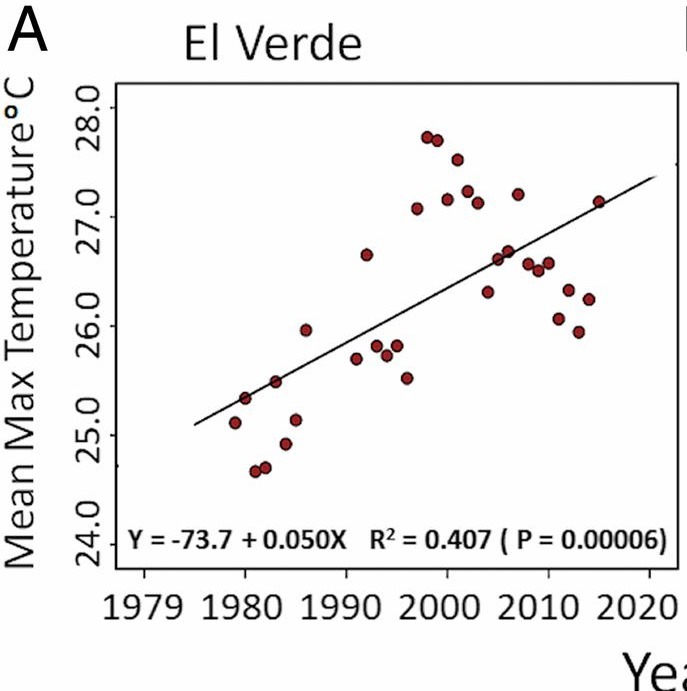 I had commented on this study in Dec 2018, but using NOAA gridded data. Same result. Very little warming over the study period, and actually a cooling since 1998. Publish-or-perish. They have to publish papers to meet their performance agreements. There is nothing to describe the quality the papers need to meet. And let’s face it – the peer reviewers will give a it quick pass if it puts everything down to global warming. With broad coverage, spanning the biological, physical, and social sciences, the journal publishes original research alongside scientific reviews, commentaries, and letters. From 1999–2009, the last period for which data are available, PNAS was the second most cited journal across all fields of science. PNAS is published weekly in print, and daily online in PNAS Early Edition. /quote. Now listen UP PNAS, unless you delete this atrocious bit of mythologizing green agenda rot by Lister and Garcia, the tattered banner, of reputation which your desperately prejudiced organization still clings to, will be rent to shreds – your justification, your reason to be – gone. Finally and we ask, when you do rightly disappear up your own crassly biased fundament: who the hell would miss you? A. nobody, no one at all, the same with; ‘nature’, RI, AGU et al. Great expose and illustration of the low standard of both scientific research and peer reviewing that is applied in “climate science”. The use without question of dubious temperatures are clearly disgraceful, however as a school-child error the abuse of regression is also clear: plotting the best straight line through a very small amount of data is bad enough, but then to quote a regression coefficient that show that the correlation is of poor quality without any comment, demonstrates real ignorance. A line with a negative slope would have only a slightly worse correlation. The most valid statistic for this spread is clearly the mean: but that is steady temperature, so cannot be. I’ve often commented about how tools like excel in the hands of idiots is very dangerous as they think that the lines automatically fitted by the software are significant even when they are not. Good old alarmists every angle covered. It’s known as CONFIRMATION BIAS. Very simple. This looks like alarmist news from the IET ! is it poor journalism? I’ve noticed their renewable coverage is also suspect. If you’re serious about contacting PNAS to have the paper withdrawn, feel free to use any of my charts, text or analyses. I am quite skeptical about the conclusions of the study as well. 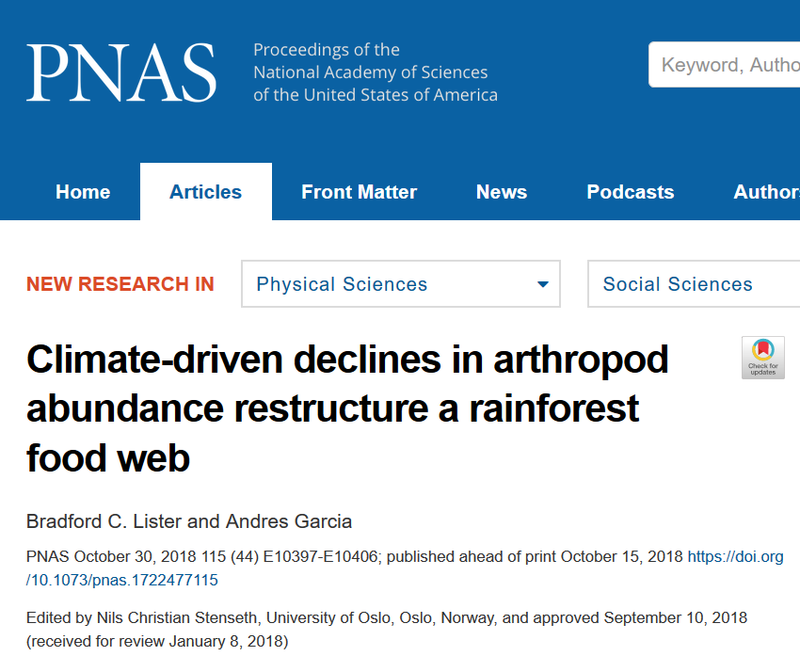 However, this critique does not address the main contention of the study, which is that the insect decline is caused primarily by a higher incidence of extremely hot days, and not necessarily by a rise in average temperatures. Does your analysis of the raw data affect this hypothesis as well?